UPDATE: Here’s an update for the Galaxy S6 faster battery drain issue. The following tips to fix Galaxy S6 battery drain issue are currently the best options. You can also read the previous fixes which are still relevant. Disable “Briefing”. Why? “Briefing” has to constantly auto-connect to get the latest news. This, in turn, drains your Galaxy S6’sbattery. Uninstall RAM cleaner apps. Why? The constant moving of data back and forth from and into your RAM storage puts a strain on the S6 battery and system. Adjust Backlight Brightness. Try not to use more than 60% backlight on your Galaxy S6. The higher the brightness settings, the more battery power your phone has to use. Before you move on to the rest of the article if necessary, do remember that the Galaxy S6 uses a 2550mAh battery. Compared to recent releases like the Galaxy S9, the battery won’t last long running the latest app/OS updates. And, as your phone ages, with several charges over its lifespan, the battery performance is bound to deteriorate. Hence, perhaps it’s time for an upgrade (if you had your S6 for a very long time). Rest assured that you are not the only one with the problem. @tailosivetech I have the galaxy s6 and recently my battery has been dying at around 12% and once even at 40%. I agree with you on having a slightly less powerful phone than a phone that dies prematurely. How was the battery life of the Samsung Galaxy S6 allowed to be that horrible?? If it comes down to it, though the S6 battery is none removable, you can actually replace it. END UPDATE. Does your Samsung Galaxy S6 battery drain very fast? Alternatively, does your Samsung Galaxy S6 overheat? Then, you are not alone. The Galaxy S6 like any other device suffers from this problem. Yes, I know you panicked a bit when you noticed reduced performance. I know I did! However, there are many things that you can do to reduce battery drain and eliminate overheating issues. How can I make my Galaxy S6 battery last longer? I thought you would never ask! Wait! Before we begin, I must tell you some things. If your Galaxy S6 has poor battery life, there are a handful of reasons why. Firstly, the number of apps you install directly affects your Galaxy S6’s battery life. Did you know that you can optimize your Galaxy S6’s battery without third party apps? Yes! You may improve the battery life right from your settings app. This article begins by addressing the battery draining issues, the possible causes, and fixes. After, the article addresses the issue of overheating, the causes, and solutions. Right? Time to learn what to do if your Samsung Galaxy S6 battery drains fast. Firstly, I would ask the question! I know you want to ask. Didn’t you say that apps affect battery life? Yes. Yes, I did. 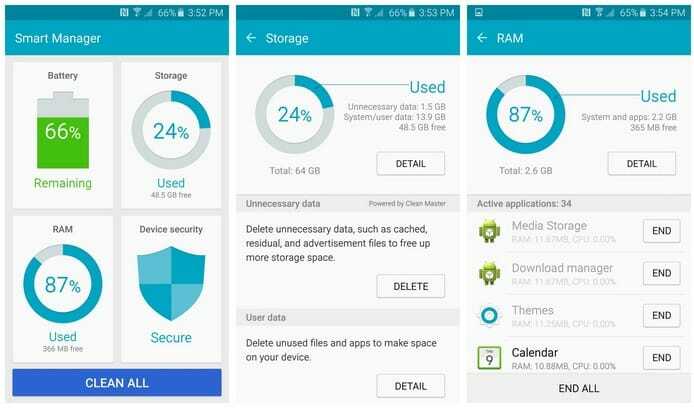 However, this app helps you save battery life on your Samsung Galaxy S6. Greenify is not your typical battery saver app. Unlike most of these types of apps, Greenify does not add unwanted apps and popup ads on your Galaxy S6. Greenify is entirely unobtrusive. It does what it set out to do. Help you regain your depleting battery life. Greenify allows you to place most of your apps in a state of hibernation. Apps placed in hibernation only reactivate when you choose to take them out of hibernation. All you have to do is launch the app you want to use. After you finish using the app, Greenify places the app back into hibernation after a period of inactivity. Greenify reduces the number of apps that run in the background. Hence, your battery life improves significantly. Are you interested in using Greenify? Then, read how to use Greenify app to extend battery life on your Samsung Galaxy S6. Once you understand how to use Greenify, then check out the other optimization tips for maximum battery life. Alternatively, check them out right now if you do not like the idea of using apps. Firstly, turn off the automatic brightness feature. This feature is the first to modify if you want to extend you S6’s battery life. Instead of automatically adjusting the brightness, set it manually. However, do not set it so low that you no longer have visibility. Reducing the brightness level of your Galaxy S6 significantly reduces the strain on your battery. Secondly, turn off the GPS. Yes! Do you know how many apps use the S6’s GPS in the background? Location Services is one of the most power consuming features of the Galaxy S6. You may think that Google Maps is the culprit. I did for quite some time. However, social media apps like Facebook, Twitter, and WhatsApp use your Galaxy S6’s GPS functionality. This usage, in turn, drains your battery life. Moreover, while location services are useful for finding places/directions, I doubt you want Facebook or the likes tracking you. By limiting the GPS & location services, you boost you Galaxy S6’s battery life. Go into Settings > Location > Mode, and you find three options: High Accuracy, which uses GPS, Wi-Fi, and the mobile network to determine your position. The high-accuracy mode drains the most battery life. Battery/Power Saving reduces battery usage. However, your GPS functionalities may not be accurate. Finally, there is Device Only. Device Only uses the onboard GPS of your Galaxy S6. Furthermore, you can disable location services altogether. However, as you would expect, this limits your S6’s capabilities. Adjust the settings to your liking. For me, I use the power save mode. However, if I go for a jog or walk, I momentarily enable the High Accuracy setting. The third setting that you can tweak is the Galaxy S6 Sync setting. As you know, sync allows your S6 to receive push notifications and updates. Hence, when you disable individual sync features, you prevent unnecessary notifications and updates. However, for important notifications, you can choose to allow sync to work. The choice is yours. Also, note that you can manually refresh or sync each of your apps by opening them. Depending on your apps, this may or may not impact much. If you have at least five apps that sync in the background, chances are they are the primary reason why your battery power can never stretch longer in a day. If you really don’t need the syncing, go under Settings>Accounts and turn them off. Switch to manual sync whenever you need an update for, say, emails. Lastly, explore the battery settings on your Samsung Galaxy S6. Get a feel for what is using up your battery life and take steps to reduce the load on the battery. Android devices have lots of settings that can reduce battery drain. Check them out! Go into Settings > Device > Battery. There, view what’s making your Samsung Galaxy S6 battery drain very fast – Moreover, if you tap on each of the apps, you can then adjust the settings to improve battery performance. There is a new feature on Android 6.0 Marshmallow called Doze Mode. “Doze Mode” prevents certain tasks from running if your Galaxy S6 is idle for a while. The idea here is to save battery life by reducing power usage while you are not using your Galaxy S6 smartphone. In the settings, find the battery configuration. From here, tap the dotted icon in the top right-hand corner. Select the battery saver or power saver option. You are now able to specify when power saving mode activates. With this feature, you limit the over-usage of your battery. Power saver reduces app activity, syncing, brightness, and other battery draining features. However, it only activates when your Galaxy S6 battery life reaches a certain percentage. Customize these features to your liking for optimal battery performance on your Samsung Galaxy S6. However, none of them are mandatory, and you will know what works best for you. Also, as a last resort, learn how to calibrate the Samsung Galaxy S6 battery. After, we talk about overheating and the ways to troubleshoot and fix overheating issues. it is important to understand that you cannot actually calibrate the battery: it is, after all, just a cell that stores and discharges energy. How to calibrate Samsung Galaxy S6 battery without root access? Discharge your Samsung Galaxy S6 fully until it turns itself off. Please remember that it is not recommended to perform this process all the time. Even when your battery is so dead your phone will not even turn on, your battery still has enough reserve charge to avoid system damage. Perform this process once every three months at the most. Put plainly: fully discharging a battery is not good for it. Trying to overload a battery is also bad for it. The good news is that charging batteries shut off when they reach the safe limit, and there’s always a little in reserve even if your Samsung Galaxy S6 will not start. How to calibrate Samsung Galaxy S6 battery with root access? It is not clear if deleting the batterystats.bin file has any meaningful effect on how the Android system reports remaining battery charge. However, there are those who swear by this method. So in the interests of fairness, the process is included for you here (it is true that different manufacturers use the batterystats.bin file for various things). It is basically the same process as above but with the added step of a root-enabled app. Now, we are going to go through the problem of the Samsung Galaxy S6 or the battery of your Samsung Galaxy S6 overheating. Please read on for more information on how to deal with this particular issue. Below you will find out how to locate the cause of the overheating and what you can do to help resolve the issue. Click ahead for the tips and tricks. How To Check That Your Galaxy S6 Overheats? If your Samsung Galaxy S6 or its battery is hot and you are looking for a way to monitor the temperature of your battery, then you are in the right place. If you are unsure whether it is your Samsung Galaxy S6 or the battery that’s heating up or getting hot, then there are ways to know for sure which of the components is causing the overheating. Use these tips/tricks to help you find the root of the problem. Firstly, you need to use the most insightful tidbit of information to diagnose the battery on your Samsung Galaxy S6 device. To get this information, you need to access an in-depth analysis of your device’s battery. There is an easy way to get this information. However, this tool does not come installed on every Android device, and it may also be absent depending on the version of Android on your device, and sometimes the carrier that you use. Nonetheless, there are still many devices that use the code to bring up information about your device’s battery; you can try this first before installing any of the recommended apps to find your Samsung Galaxy S6’s in-depth battery information. Opening the dial pad, as though you were going to dial a telephone number, and type in ##4636##. If this feature is available on your device, then a screen should automatically appear. Battery Drain Analyzer is a sophisticated app that tracks your battery and power usage behind-the-scenes to give you an idea of what’s using the most juice. Think of it as Android’s built-in battery usage app on steroids; it offers tons of statistics and numbers that should satisfy even the most demanding power user. As the name implies, the app will analyze app and electricity usage and let you know which apps are draining the most power, or if it is even an app that’s causing battery drain. The Analyzer screen shows what percentage of app drain is caused by what system activity, whether that is your screen, applications, phone idling, Wi-Fi or Bluetooth radios, etc. Below that, it shows which applications are consuming the most battery, including the infamous Android OS battery drain, rated by percentages. If Facebook is using 65% of the battery drain caused by apps, for example, you have got a pretty good idea of what’s causing your power usage. Battery Doctor is a helpful battery analyzer and extender that also has a few tricks in its toolbox that you will not find in other apps. On the surface, it offers a neat interface for checking out your battery life. It gives a rough estimate of how much battery life left you have left in your current charge based on your usage habits at the time, but it goes a step further by showing how much potential battery life you can save by turning off specific radios or application syncing. There are many other apps on the Google Play Store, but these are the ones recommended. You can check out some more of these apps here. Once you have the app, then you can proceed to analyze your Samsung Galaxy S6 battery statistics to find the cause of your battery overheating problem. This one is a bit tricky. Sometimes it is best to check the battery of your device as a whole. What you are checking for is to see if the Samsung Galaxy S6 battery is bloated or malformed. Wait, the Galaxy S6 has a non-removable battery, right? Yes. On paper, it is. However, if you have the time, the skills and the right tools, you can replace your Galaxy S6 battery yourself. Is there a tutorial? Why, yes! There is! Right here! Do note hat tampering with your device voids the warranty. However, if you can gain access to the battery by removing the back cover then do so and perform a visual inspection of the battery. If you cannot see any malformations, then set the battery down on a flat surface and see if it remains flat or if it rocks back and forth. Should the battery not sit flat then you may need to replace your S6 battery with a new one. So, you now know that your Galaxy S6 or the Galaxy S6’s battery is faulty. What do you do now to resolve the problem? Well, there are various things you can do. You can get a new smartphone if you are on warranty, perform a repair, buy a new battery and whatever else as we explain below. Is your Galaxy S6 still under the manufacturer’s warranty? Then, the warranty covers defective or malfunctioning parts. You are one of the lucky ones! Take the device back to Verizon, Sprint, AT&T or whichever carrier that issued the warranty. Explain the situation and have them try to fix it. If they cannot fix your Galaxy S6 or are too lazy to do so, then they will replace it under warranty. Note that most cell phones and cell phone batteries will have what is referred to as an LDI (Liquid Damage Indicator) somewhere on the device which, if exposed to moisture or liquid, will change from white to pink or red. If your battery’s LDI has been activated and contains any pink or red, then that battery is no longer covered under warranty, and you will likely need to purchase a new battery or smartphone instead. Read about the Galaxy S6 and water damage here. Also, you must not have tampered with the phone in any way. Any form of tampering voids your warranty. If you are going to buy a new battery, then it is best to go to a repair shop to have it replaced. A repair shop is your best chance at having a safe “procedure.” Be sure to buy a replacement Galaxy S6 battery before you do so. Now, we look at other reasons why your Galaxy S6 overheats. Here are things to look at to find the cause of the overheating. Samsung Galaxy S6 Battery Getting Hot! A hot Samsung Galaxy S6 battery does not necessarily indicate a bad or defective battery. It may also indicate an issue with the Samsung Galaxy S6 itself. Moreover, before you go off to replace the device or the battery, you ought to consider reading on below for some great suggestions on how to fix a Samsung Galaxy S6 that’s hot or overheating. Your Samsung Galaxy S6 will get warm. After all, it is an electronic device. Do not panic if your Samsung Galaxy S6 gets a bit warm. However, your Samsung Galaxy S6 should never get HOT! If your Samsung Galaxy S6 gets so hot that it feels like it is overheating, then you might risk damage to your S6, yourself or those around you. What you need to do is figure out what is causing the problem and learn how to prevent your Galaxy S6 from overheating. Go over the following to troubleshoot. Where Does Your Galaxy S6 Get Hot? Firstly, try to find the location where the Galaxy S6 is getting hot. It does not necessarily have to be the phone that gets hot. It could be the battery or the charger and even the speakers that are causing the problem. So, where exactly does your Samsung Galaxy S6 have overheating problems? When your device starts to get warm does it seem to be the whole phone or does it appear to be mostly in the back area where the battery sits? Perhaps it is not the device that’s overheating but the battery inside. Check above to know how to troubleshoot the battery. Is the Galaxy S6 getting warm towards the bottom where you plug in the charger? Is your device only getting warm while being connected to the charger? If so, then there might be an issue with the charger itself. Make sure to try a different charger, preferably one approved by the manufacturer of your device, to see if your device continues to heat up. Use the official Galaxy S6 charger/USB Cable. If a new charger fixes the problem, then you can get rid of your previous charger and enjoy work with the new charger. If it is not the charger, then continue the guide. If the back of the Galaxy S6 gets hot and it is not really where the battery sits, then there is a good chance that a component Samsung Galaxy S6 itself is overheating. If this is the case, then there can be a few reasons why this is happening. Read on for a bit of info on troubleshooting the different parts of your Galaxy S6. Your Galaxy S6’s screen can get warm, but if the touch screen or display screen is getting too heated or even hot, then this is another indicator that there is an issue with the S6 itself. The tips outlined below will help resolve the issue with your Galaxy S6. Read the reasons why your Samsung Galaxy S6 is overheating and the things you can do to cool down your Galaxy S6. How to Fix A Samsung Galaxy S6 That Overheats? Now that you have narrowed down the overheating issue to the device and not necessarily a problem with the battery or the charger, it is time to find out what you need to do to get the heating down. Below is a list of the most common reasons and best resolutions that you can use to combat overheating on your Galaxy S6 smartphone. Apps and features on your Samsung Galaxy S6 are the same as any other thing that you have around your household. Things can get cluttered and become overwhelming for your device. If your device has started to get warm or hot unexpectedly, then there is a good chance that your Galaxy S6 smartphone has processes, such as applications, that are running in the background and you do not even know that they are running. Furthermore, some apps might start running as soon as you power on your Galaxy S6. If you have read the article from the top, then you already know that you need to uninstall a few of these apps or put them in hibernation mode whenever they are not in use. The Samsung Galaxy S6 is a powerful device! That is one thing of which we can be certain. However, you probably think that you can use Facebook, Snapchat, WhatsApp, Twitter, and other social media apps all at once without slowing down your device while streaming media from Hulu, YouTube, Netflix, Fox Sports Go, Starz, or the ShowTime Anytime app continuously without problems. Heck, you’re probably browsing your favorite dating apps, using Google Chrome to do research on your next adventure, and so much more. While all this is good, there is a limit that you need to pay attention to. This restriction affects how long and how often you can do the same things over and over before they take a toll on your Samsung Galaxy S6’s performance. Let’s have a look at a couple of the things that your Samsung Galaxy S6 can do well but which might cause it to overheat in the long run. Watching videos and other media content is one of the things that can make your Samsung Galaxy S6 a great device. Looking at a movie when traveling can make the time it takes to get to your final destination go by a lot faster. Viewing movies and playing videos regularly, however, certainly requires more work from the Samsung Galaxy S6 processor. Moreover,, not only can it consume a lot of battery power but, it can cause the smartphone to get hotter over time. The Android App store has a pretty wide selection of some pretty fun and entertaining games. There are even more games to try with apps like XMODGAMES. Some of these games and applications require more processing power than others depending on the complexity of the app, and when you add this required processing power with extended usage, then things can start to heat up a bit. What you have to remember is that many of these games might very well require you to use other resources on your Samsung Galaxy S6. Many games require a data connection which means that your Galaxy S6 now has to maintain an active internet connection via mobile data or Wi-Fi connectivity, the app might need to access your contacts both on your device and social media accounts, etc. All these things add up, and your device can get scorching over time. If your Samsung Galaxy S6 seems to start overheating when it is in your pocket/bag/etc., then take it out of the confining area to let it have a bit of fresh air. If you need to keep your device nearby, then you can keep it in a backpack (non-cluttered), locker, or in a protective case on your waist. Protective cases are one of the best investments that you can make for a device. They help keep your device well protected and can certainly help save the phone from accidental falls or accidental damage. Always invest in a good case for your smartphone., However, you may want to try using your phone outside of the case for a little while to see if the phone continues to overheat or if it helps prevents the phone from getting hot. Other less common but possible reasons a Samsung Galaxy S6 can get hot. These range from water damage, over-usage, outdated software, and hardware. Do you listen to music from your device while taking a shower? Do you keep your device in a humid pocket? Alternatively, has your device simply had an accident where you dropped it in some liquid? Power issues and overheating are common problems that a water damaged Samsung Galaxy S6 can experience. Try to locate the LDI (Liquid Damage Indicator) sticker(s) on your device. Make sure that your cell phone is not experiencing any side effects of moisture or liquid damage. Your phone may very well have moisture damage, and you might not even know it. When was the last time your device got to rest for a few minutes? Does your Samsung Galaxy S6 remain turned on continuously throughout the day? Do you leave your S6 powered on and plugged into a charger all night? It might just need to be powered off to rest for a little bit. As Androids get used, apps and processes can start to run and continue to run until they are manually stopped or the device reboots. However, being constantly powered on can also cause minor software problems which you can solve by restarting the phone. The,n these things are going to be running all at once, and they are going to be causing your Samsung Galaxy S6 to work harder and could be causing your S6 to heat up. Chances are your Samsung Galaxy S6 has some widgets on its home screen(s), and you did not even know it. Try to remove them and reduce the load on your smartphone. If you do not know what overclocking means, then you can likely disregard this little piece of advice altogether. If you have manipulated or customized the software on your Samsung Galaxy S6 to get it to go faster or run differently, then you may have inadvertently caused the overheating on your device. Just remember that if you choose to overclock your Android and as a result, it is getting hot, heat can lead to a shorter lifespan for your device and can even cause hardware damage depending on how hot your phone is getting. Try to think back to when your mobile phone started to get hot. Can you remember anything happening to the S6 around that time that could shed light on the recent overheating issues? Was the device dropped accidently? Are there any signs of physical damage on the Galaxy S6? If so, then this might be the culprit and fixing it might be more of a challenge as the damaged piece that’s causing the device to heat up would have to be located and repaired or replaced. Just like a possible hardware issue can you remember downloading any new applications or programs etc. around the time that your Samsung Galaxy S6 started to get hot? If so, then you may want to locate that application and disable it or even temporarily uninstall it just to rule out the possibility that it is not that app that’s causing any problems on your device. If you have done everything that you can think of to try and get your Samsung Galaxy S6 to stop heating up and it is still getting hot, then you might also want to consider backing up all of your device’s valuable information and then perform a hard reset on the unit. The only catch is that it removes all of your other information as well. What not to do when your Samsung Galaxy S6 overheats? Do NOT put your Galaxy S6 into the fridge or worse a freezer. Exposing your mobile phone to extreme temperatures coupled with moisture is just a bad idea all around and is not recommended. Samsung Galaxy S6 Still Getting HOT! Luckily if your Samsung Galaxy S6 is still less than a year old and doesn’t have any physical or liquid damage, it is highly likely that the manufacturer’s warranty still covers your device. Did you confirm that your Samsung Galaxy S6’s battery is at fault and is getting hot to the point of overheating? Then, you may need to consider a replacement battery. You do not want a hot battery to cause damage to your cell phone and cause even more trouble later on. Sometimes your Galaxy S6 loses power even when on the charger. I have changed out cables. Done a soft boot and close all apps. It takes all night to charge to 100 percent now. I have lost 4 percent in 5 minutes. Thanks for reading our Samsung Galaxy S6 Battery Drain and Overheating Fix tutorial. I hope you have enjoyed it and that you will be able to get the most out of your Samsung Galaxy S6 battery. Please share the post with your friends so that they too can have optimal battery performance and so that they may also learn how to prevent overheating issues on their devices. Hello I would like your help please. I purchase two months ago a new Samsung S6. Tree weeks ago I had the overheating note on my phone and I took it to the shop where I bought it they updated my battery features but the phone was still not working. They sent it to the manufacturer and the answer was that the phone had humidity in such a degree in which the motherboard had a corrosion. Is this possible to happen in a brand new phone in such a small period of time? The phone was not exposed in humidity and not drop in water or anything similar. I am waiting for your response.Thank you in advance. Hi my S6 started overheating two days ago. Now when it powers on you get maybe 60 seconds before it shuts down. I cleared the cash and got nearly 3 minutes before shutdown – then the next restart all apps were locked. and i cant do very much. I connected to PC to backup data and it had shutdown before I got the file transfer page open. very frustrated at a £650 phone.